With Democrats' control of the House comes an internal battle for who will lead their party moving forward, to be decided in the coming weeks as Congress returns for the lame duck session. 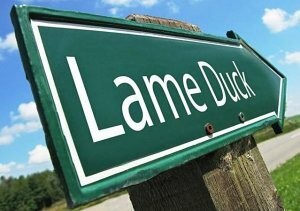 A lame-duck session is when one Congress meets after its successor is elected, before the new Congress convenes for the new term in January, to address pending or unresolved legislative issues of the current term. The lame duck session is also an opportunity for the current Republican majority to push through any key legislative initiatives before Dems formally take control of the House. At the top of the GOP agenda is immigration, and funding for President Trump's US-Mexico border wall - a debate that threatens a stalemate. The House and the Senate jointly must pass appropriation bills to ensure sectors of the government budget continue to receive funding. With five out of twelve House and Senate appropriations bills passed, Congress must still agree on a remaining seven by December 7th, or face a partial government shutdown. The outgoing members of the 115th Congress will be joined by the freshman class of the incoming 116th Congress, who descended on Washington today to begin their congressional orientation. The newbies won't be voting on legislation until they are sworn into office January 3, 2019, but will spend the next week learning the ropes, organizing their new offices and jockeying for committee assignments. The entire class will attend the Program for Newly-Elected Members of Congress at the Harvard's Kennedy Institute of Politics December 4-6th. Their most important agenda item, however, will be electing their leadership in a vote expected to take place November 28 and 29th. The floor leaders and whips of each party are elected by their respective parties in a closed-door caucus by secret ballot. 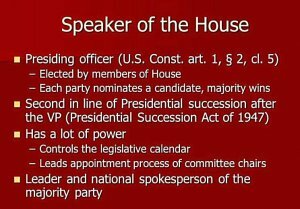 The Speaker is nominated in closed-door session, but not officially elected until a public vote when the new Congress reconvenes. It takes a majority of 218 votes to secure the Speakership. Representatives, responsible for the House legislative calendar and direct management for all House committees. The Speaker does not usually participate in debate and rarely votes on the floor. Nancy Pelosi (CA): First elected to Congress in a special election in 1987, Pelosi served as Speaker from 2007 to 2011, and as Minority Leader since under Republican control of the House. Pelosi was the favorite subject of attack by GOP conservatives in the midterms, who attempted to tie their Democratic opponents to the "liberal leader from San Francisco" in individual races. 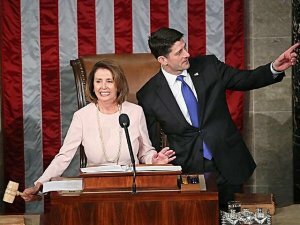 Calls for Pelosi, 78, to step aside for the next generation of leadership have persisted since 2016, when she was challenged by Tim Ryan (OH), then 43, in the race for Minority leader, and lost 63 votes on a secret ballot. 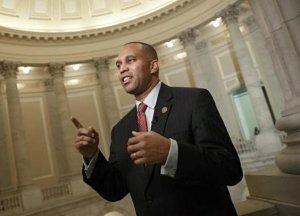 A small contingent of incoming progressive Members have publicly stated they will not vote for Pelosi, including Max Rose, Jason Crow, Haley Stevens, Anthony Brindisi, Abigail Spanberger, Jeff Van Drew and Joe Cunningham, as well as Conor Lamb. 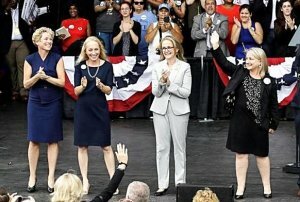 The formidable legislator and political tactician, however, has not drawn opposition this time, and after leading the successful overthrow of the House, in a year that will seat the largest number of women and minorities in Congress, a serious challenge is unlikely. Duties: Responsible for managing and scheduling the legislative agenda, lobbying colleagues on floor measures, and, in general, working to advance the goals of the party. Steny Hoyer (MD), 79, who has served as House Majority Leader from 2007 to 2011, and Majority Whip under Republican control, is unchallenged. Duties: Assists in managing, tracking and "whipping" the majority party's legislative agenda and votes. Candidates: Congressman James Clyburn (SC), 78, has been House Assistant Minority Leader since 2011, and served previously as House Majority Whip from 2007 to 2011. Clyburn is being challenged by Congresswoman Diana DeGette (CO), 61, who currently serves as a Chief Deputy Whip, an appointed position. Duties: Liaison between the leadership, the Appropriations Committee and the rest of the caucus on spending matters. Candidates: David Cicilline (RI), member of the LGBT Equality Caucus and Ben Ray Luján (NM), member of the Hispanic Caucus. Duties: Management of the Democratic Caucus agenda, presides over committee assignments, caucus meetings and rules of conduct, development of party policy and legislative priorities. Candidates: With the primary election defeat of Joseph Crowley (NY), the open Chair's position is being sought by two candidates, both members of the Congressional Black Caucus: Barbara Lee (CA), 72, & Hakeem Jeffries (NY), 48. Duties: Work with Caucus Chair on all Member-related matters. Candidates: Progressive Caucus member Katherine Clark (MA) and New Democratic Coalition member Pete Aquilar (CA). Duties: Leads the Democrats' campaign arm, responsible for re-electing and electing Democrats. Candidates: In the first contested election for the position, there are four contenders: Suzan DelBene(WA), Denny Heck (WA), Cheri Bustos (IL) and Sean Patrick Maloney (NY). Until 2016, the DPC Chair was one appointed member. Now three, elected Members are tasked with developing a Caucus-wide message. Candidates: Debbie Dingell (MI), Ted Lieu (CA), Adriano Espaillat (NY), John Garamendi (CA), and Matt Cartwright (PA). 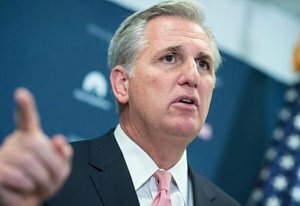 In tomorrow's Republican leadership elections, Kevin McCarthy (CA) is heavily favored over conservative Jim Jordan (OH) in contest to replace retiring Speaker Paul Ryan (WI). Current GOP Whip Steve Scalise is unchallenged, as is Liz Cheney (WY), for Conference Chair.